A child can choose to read from a selection of hundreds of children's books but there is only one series for children who love dogs with exciting adventures! 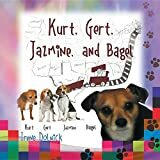 If your child finds reading difficult because of their dyslexia or because they are English Language Learners, each book introduces different word families discussed in classrooms with segmented-blended, color coded, pronunciations. The second book improves upon the first with a dictionary at the bottom page for the word being introduced and the pronunciation next to the word instead of underneath it. Both introduce differences in common speech sounds. Irene Dolnick has four beagles, whose love is the inspiration behind her creativity and who have taught her that dogs are as adventurous as people. Irene lives in El Paso, Texas, a warm climate that allows her to share in the dogs' craziest schemes.